To translate the title of this post: the National Library of Spain (BNE) has developed a linked data set for its bibliographic data that makes use of FRBRer, FRAD and ISBD in RDF. There are a number of interesting aspects to their decisions, and we can now compare this solution to the solution used by the British Library for their National Bibliography (diagram in PDF). What I find particularly interesting about this interpretation of FRBR is that the Work ("obra") and Expression ("expresión") are considered authority entities, while the manifestation, in the darker area below, is a bibliographic entity. (If this is common knowledge, I must admit that I hadn't seen this expressed so clearly before.) The Work and Expression are coded using RDF properties (e.g. "data elements") from FRBRer, FRAD and FRSAD; the Manifestation uses RDF properties from ISBD. These are the same element sets that Pat Riva recently announced on various lists. 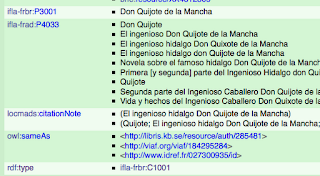 There is a fascinating visualization of the entities and links for de Cervantes and his works. Note that you can zoom in and see more detail in the many nodes there. The visualization project is "in progress" and at the moment you cannot move directly from the nodes on the screen to the actual data (except by plugging in the URIs that you see). The resulting displays are similar to those of DBPedia, which means that you basically have to know what you are looking at in order to follow from one entity to another. Obviously this isn't easy to read since the display does not yet substitute the names for the ID numbers of the ISBD and FRBR entities (e.g. isbd:P1004 is "has title proper"). I find it particularly interesting to see this example of library data in linked data form because the only thing new here is the use of linking -- the data appears to me to be basically vanilla ISBD, re-organized using FRBR entities. One could conclude that this means that we could move into linked data without taking on the RDA step. 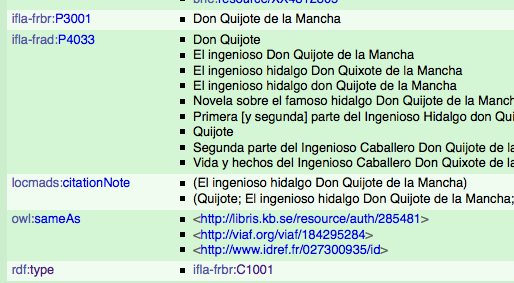 I would very much like to see how these examples would be different if RDA were the applied cataloging rule set. The view of Works, Expressions, plus of course Persons, Corporate bodies, and Subjects, as akin to today's authority records really serves to separate the linking entities from the description (which is in the Manifestation). 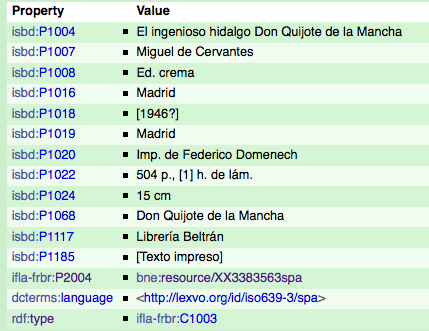 The manifestation remains primarily text strings, but the examples in the BNE demo suggest that there are significant opportunities to create links between library resources and potentially to non-library resources without major modifications to descriptive cataloging. In fact, it looks like our attention should be on our authority data, which provides the linking opportunities. More and more I come to the conclusion that in the linked data space the thing we seem to focus on today, descriptive cataloging, will be less useful than the entities that are represented by our authority data. For this reason I see VIAF as a very good start because links to and from those personal and corporate entities should give us a lot of connections to the rest of the world. In a long-awaited move , Google has announced that its search will now be "semantic." They don't actually mean "semantic" in the sense of the semantic web, although there are similarities. While what Google is doing may not formally follow the W3C standards for the semantic web, there is no doubt that they are performing acts of "data linking" that make use of the concepts of linked data. The W3C standards for linked data are designed for openness, so that data from disparate communities can come together. Google has no obligation to play well with others and, as we saw with the development of schema.org, is in a position to make its own rules, many of which are known only within the giant Google-verse. They call their technology a "knowledge graph" and talk about "things not strings." 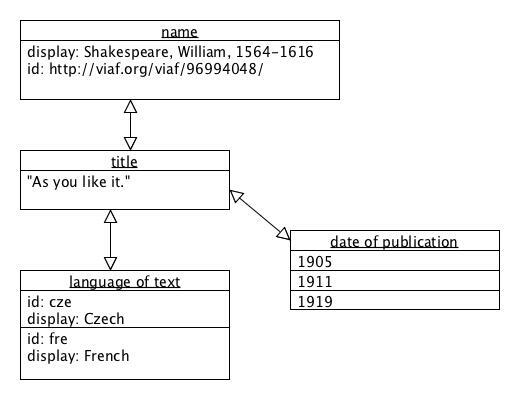 I've used this same phrase myself in numerous presentations on linked data. Google has always been about using links between things on the web to determine its brand of "relevance" of a web resource to a search query. By using existing linked data, via large stores of links like Dbpedia, Wikipedia, Freebase, and presumably others, Google can now expand its offerings from a single list of results to additional information about the topic that might be the intended topic of the searcher. I say "might be" without any irony; whether in a web search engine or a library catalog, the communication between the searcher's mind and the device that provides results is always only approximate. What the additional data provides is not only more context but a more ample explanation of the topics that have been retrieved. No longer do users have to guess from snippets the meaning of the results in the result set, but they can see a Wikipedia-like entry that not only gives them more information, but it contains links to other sources of information of the topic. 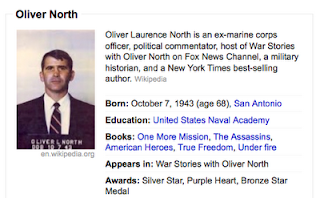 Imagine that you have an 18-year-old user who finds a novel on your library's shelf by Oliver North. 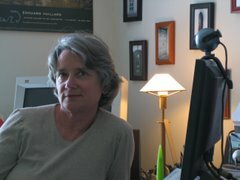 The user looks up the author in your catalog and sees that this person has written a few other books, but oddly always with a "co-author." Is someone so inept worth reading? 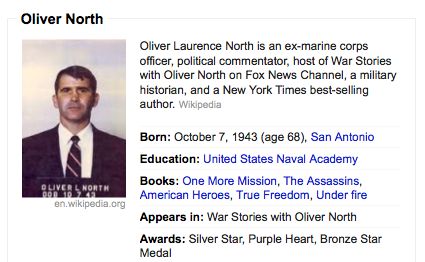 Now imagine that your catalog also presents the user with the context: Ollie North, Iran Contra, and related persons. Suddenly the user sees where North fits into US history, has a chance to find out what an interesting character he is, and the books take on a whole new meaning. That was before I saw this Google result. We treat library users as if they are all-knowing; as if they know each author in our catalog, as if the title of the book and the number of pages is sufficient for them to decide if it is a good read or has the information they need. This is so obviously false that I am at a loss to explain how we continue to work under this illusion. Google purchased the only linked-dated search system, Freebase, in July of 2010, thus tipping their hand that they were moving in that direction. Not only did they acquire Freebase and the skills of its employees, they eliminated a potential rival (although it may be silly to consider that anyone could really be a rival to Google). When I worked for the University of California we moved our offices a number of times, and sometimes into space that was being newly renovated. During each of these moves we were given diagrams and asked to choose a configuration for our cubicles or offices. One of the configurations, at least for offices, was the option to be sitting behind a desk rather than having the desk against a wall. In executive offices, the "behind the desk" configuration is de riguer. Its purpose is to put a solid barrier between the occupant and the visitor, and it symbolizes the power of the person who sits behind the desk. At my public library, all of the available staff (except the shelvers) are located behind desks. There is the information desk, the reference desk, and the circulation desk. In this case, the desks do not make the person look powerful; in fact, they make the person look unavailable and powerless. The people behind a desk cannot (easily) leave the desk, they are stuck there. If a person asks for help the staff member can point but can't go with the person and help. Admittedly, some of the seated staff give the impression that just being asked to stand up is a burden. The desk creates a physical space between the library user and the staff. Think about how it feels to be talking to a person who is behind such a barrier compared to being "corpo a corpo" next to them with no barrier. The social distance created by the desk is huge. The desk sets up an inequality between the user and the staff member because the user has to go to the staff member, the staff member cannot go to the user. If you ask a reference question, head off to the stacks, then discover that you aren't finding what you need or have thought of another question, you have to go back to the reference desk. In a large library, that can be quite a trek. Do that a couple of times and you are likely to quit asking since it's too much trouble. I want my library to be more like the Apple store. I want there to be staff visible in the library space but not sitting at desks. I want them to be, for example, near the catalog or at key entrances to the stacks. I want to be able to identify them as staff so I can approach them if I have a question -- it just takes a colorful T-shirt to accomplish this. I want them to be mobile, not glued to one spot. I want them to be in the same space as I am, not separated out to staff-only spaces. I want them to have their tools with them, perhaps a tablet where we can access the catalog and various resources together, right where we are. Even the shelvers could be equiped with the ability to send an SMS to the reference staff and either queue the person up for help or get an answer directly. Some staff need to stay put, for example the circulation desk staff (note how we call it a desk, almost always?) Even having staff at open "pods" rather than behind desks would give a different impression. So this is my wish: a library that feels like it is staffed by real live people, who walk and talk and mingle with the users. Wow. What a concept.